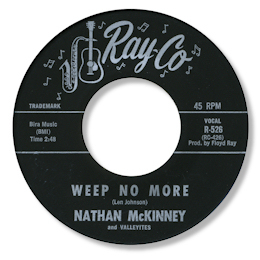 Nathan McKinney recorded a couple of 45s for Floyd Ray’s Los Angeles Ray-Co label and both were an interesting combination of doo-wop, gospel and the blues. The best side he cut was written by that fine bluesman Len Johnson all of whose 45s are well worth exploring. Weep No More is a classic “Soul Of Vietnam” song on which McKinney is suitably doleful, with some very strong vocal support from the Valleyites. By McKinney’s next release they had become the Chambers Brothers and Soldier Boy was very much in the same mould. Great screaming finish to this track. You can hear a version of “Weep No More” by Chicano group Six Pack here. McKinney returned to the studio in the early 80s cutting a pretty boring disc called “Very Special Lady” which is now well thought of by the boogie crowd.